Looking for the perfect stocking stuffer this Christmas? The Dakota Wesleyan music department has just the thing – a compilation of its greatest hits on CD. The Ron and Sheilah Gates Department of Music has created a CD with its best choral and bells recordings from 2014 through 2018. 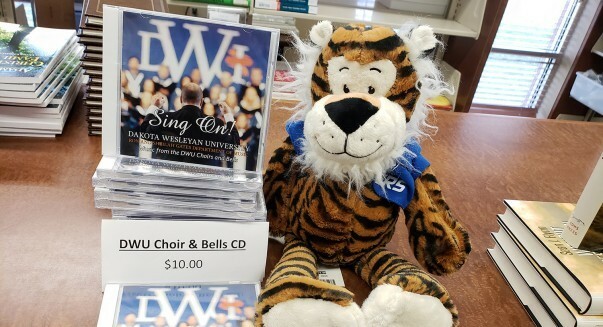 The CD is on sale now for $10 at the DWU Campus Bookstore and is available for purchase at DWU choir and bell performances. DWU's "Gloria! Christmas at Dakota Wesleyan" is set for Dec. 1-2. Click here for details. “Sing On!” contains 24 tracks from past performances by the Dakota Wesleyan Choir, Singing Scotchman, Women’s Chamber Choir (now called the Dakota Dynamics), The Highlanders and Wesleyan Bells. The CD contains both live performances and recorded sessions. Dr. Clinton Desmond, director of choral activities at DWU, said that the original plan was to release a CD from 2014-2015 but after some deliberation the department decided there was not enough material.